Had an interview and never heard any feedback from the recruiter yet? Don’t worry. A recruitment process may take a while, plus they’re probably going through multiple applications as you sit and wonder if you have been considered for the position. You can always send in a follow-up e-mail to let them know that you are looking forward to hearing a feedback from them. Follow-up e-mails should not be seen as a daunting process. Sending in a follow-up e-mail does not have to be complicated, but the thought of sending one is probably making you nervous. It is understandable because we do not want to sound pushy. 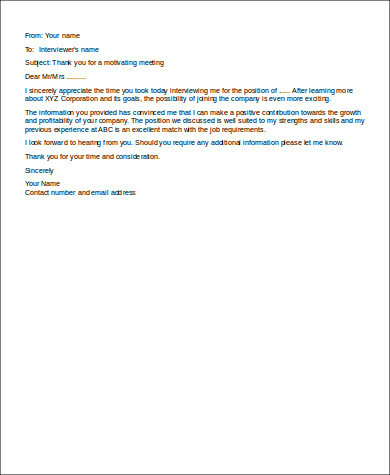 Referring to our Sample Follow Up Emails templates can help you out to formulating the right words for that follow-up e-mail. Whether your interview went well or it was a disaster, sending a follow-up e-mail can help you out in the process of getting hired or, at least, short-listed for the job opening. 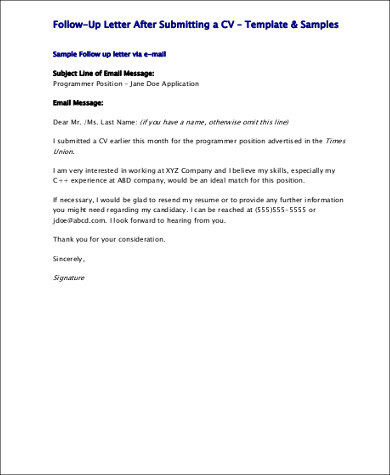 Sending follow-up e-mails are a great way of asking whether you are being considered for the position or not. Remember, recruiters do not focus on you alone, so not getting a feedback does not mean that your application has been thrown to the shredding machine or has been forgotten. They also take care of other hopeful applicants who are also actively seeking for a job. 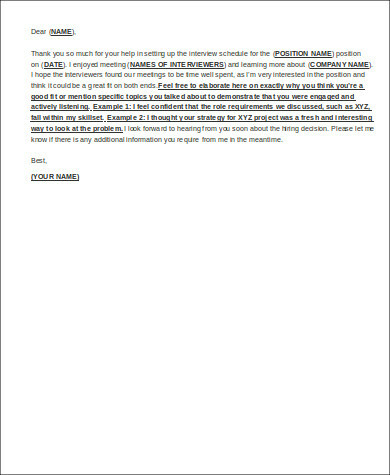 Your first follow-up e-mail should mainly express your gratitude for being scheduled an interview with them. A few days after the initial follow-up, send another follow-up e-mail to check how things are going regarding their decision-making process. 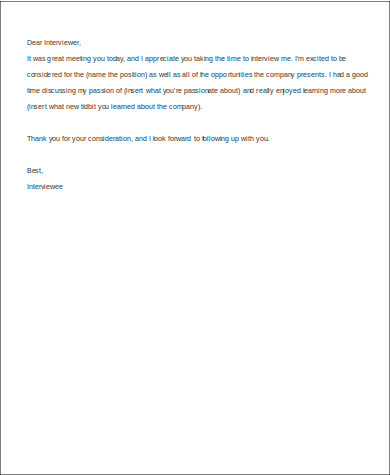 Keep a cheerful, at the same time, a professional tone to your e-mail. Follow-up e-mails help establish a positive relationship with a recruiter, so do not hesitate to start typing that follow-up e-mail. Our Free Email Samples templates can help you make a good follow-up e-mail, and you never know, the response you might get from following up could be the good news that you have been waiting for. 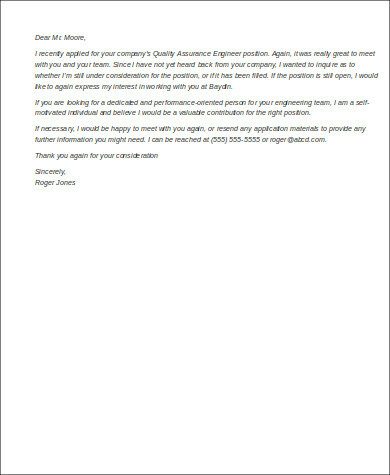 Following up lets recruiters know that you are a serious and trustworthy candidate that they would not regret hiring. It shows that you are goal-oriented and that you are willing to go the extra mile in achieving your goals. The templates presented in this article can be your guide to stepping up your game when it comes to seeking jobs that match your qualifications. As a job seeker, your initial goal is to get your phones ringing and your e-mails blasting with notifications from recruiters. 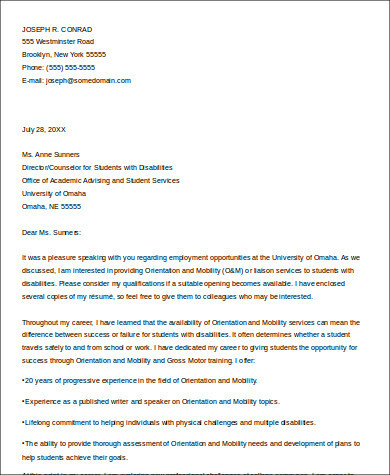 A follow-up e-mail is just as good as any interview and can be a good strategy to achieve that first step to getting a job that could turn into a long-term career. 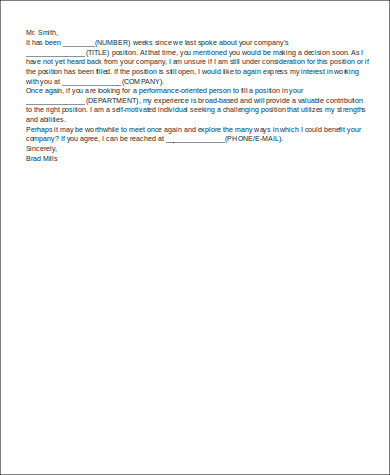 You can also see Resignation Email Samples.